I was asked to attend a work event in Kraków, Poland, and they asked Ronda to attend as well! My mom was still in town and she offered to watch Cooper for a few days while we went to Kraków. We couldn't pass up the opportunity! We arrived in Kraków on Thursday afternoon after a late train almost made us miss out on the whole trip. But we made it and got to our hotel right in the heart of Kraków's old town. We had about 3 hours to spare before I had to work, so we walked outside the hotel right into the town square called "Rynek." We found a restaurant with a great seat and had an excellent meal. Great place for some people watching. When we were done eating we walked through St. Mary's Cathedral to admire the art and decoration inside the church. After work on Day 2, we took a really cool city tour on a golf cart! 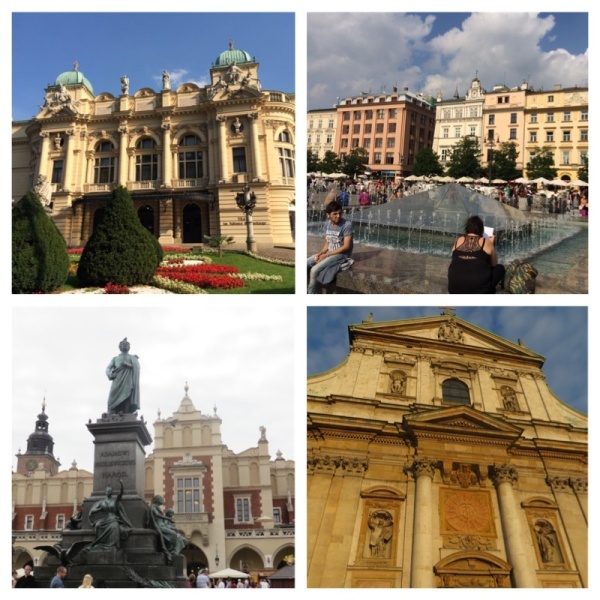 The tour took us through the old city, to see the City Wall, the Wawel Castle, St. Florian's Gate, and the Rynek (again). It also took us to the Jewish Quarter where we saw several pre-war synagogues and lots of cool little restaurants and cafes. After the tour we walked around quite a bit and found a park, lots of market stalls, a few more churches, and lots of shops and cafes to check out. Kraków has a lot to offer!! We finally decided on a place for dinner and sat down around 8:30pm. Our restaurant was next to another restaurant where a live band was playing traditional Polish music. It was a great setting and we enjoyed the perfect weather and the atmosphere. 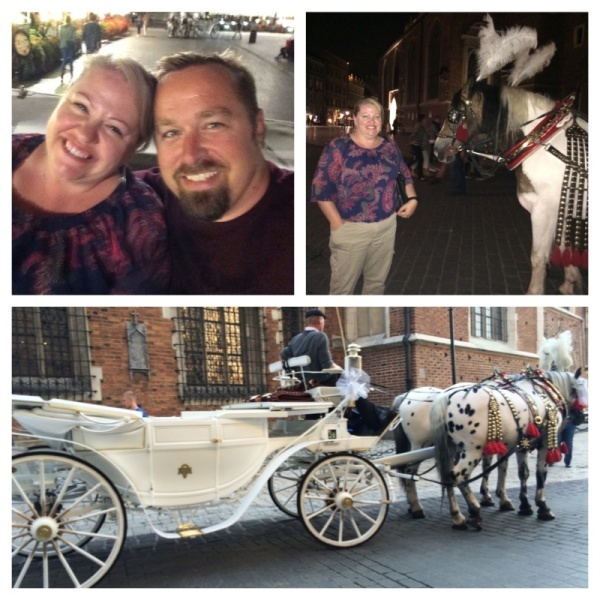 After dinner we took a horse-drawn carriage ride around the old town and got to see the city at night. So beautiful; and Ronda loved being able to smell the horses! On our last day in Poland, we woke up to heavy rain. But to make the best of it, we decided to catch a cab to the Wawel Castle to do some indoor sightseeing. At the castle, we took the Royal Apartment Tour, the Staterooms Tour, and the "Lady and Ermine" tour. We had an English speaking tour guide on the apartment tour, and we learned a lot about the castle and all of the different people who have lived there for several centuries. 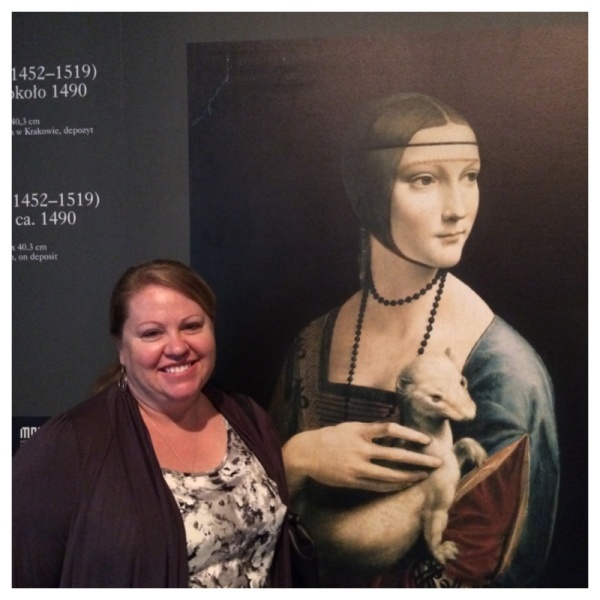 We also got to see one of Europe's treasures, Leonardo da Vinci's painting, "Lady and Ermine." The story about the history of the painting is more interesting than the painting itself, but it was cool to see an original work by LDV. After touring Wawel, we walked back to the Rynek and got a Kielbasa for lunch from a vendor at the market. We sat under the statue of famous Polish poet, Adam Mickiewicz, and ate our lunch in the middle of the busy square. It was a cool experience. We met our ride to the airport at the hotel, drove to the airport, and got back to Stuttgart by 6pm. It was a great trip and I was so thankful to have the opportunity to explore Kraków.